From the Hancock County Courthouse, go east on Hwy 22 for 7.5 miles to Springfield Church Road. Turn left on Springfield Church Road and go 3.6 miles (which is 0.2 mile past Springfield Church). 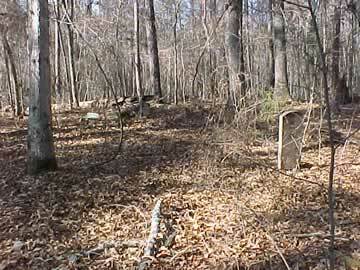 There is a yellow gate across a small dirt woods road on the right. Follow the dirt woods road about 60 yards to a fork. Take the right fork. Follow this woods road about 1/4 mile and the cemetery will be on the left. A big THANK YOU to Mike Thompson [mtstorm@mindspring.com], who researched this family, locating the service record of William O'Rear and death date of Matilda O'Rear, and uncovered the buried slabs with names and dates for Annie Arpie O'Rear Brinson and Mark Anthony O'Rear. He contributed this information and his pictures in February 2007. Co. I 59 Ga Inf. An Honest Man is the Noblest Work of God. Surrendered at Appomattox, Va, Apr 9, 1865, per pension record. page 166. Service not listed on stone. Died Marion Co., Ocala, FL per Death Certif. from Jacksonville, FL, and obit from Ocala Banner newspaper, Sept 11, 1930. Age 79 years. "Miss". Death date per Petition in Court of Ordinary, Jul 30, 1894- See Hancock Co Inferior Ct Minutes, Vol 1, p. 507. No date appears on her gravestone. At least 7 depressions, some marked by fieldstones.